This sample two week (14 nights) itinerary covers Dubrovnik, Hvar, Split, Plitvice, Rovinj & Venice. The services we provide as part of our comprehensive packages include accommodations, ferry tickets, transfers (airport & port) and city tours as well as a rental car for a part of the journey. In addition to the tours included we can arrange a number of excursions based on your own interests. There is also an option to travel between cities by private car or van transfers at an extra cost. Our Destination Manager in the region provides assistance before and during your travels. They will be available to you leading up to the trip to answer any questions and arrange local services. You will be provided with information on the best these destinations have to offer including things to see and do, restaurants, entertainment and other insider tips. Upon arrival we will provide you with a local cell phone that you can use to contact our Destination Manager throughout your trip. In all of our destinations we offer a variety of accommodation options including boutique style hotels, charming B&Bs and spacious apartments ranging from a three to five star level. From our first hand experience we can ensure they are all clean, comfortable and centrally located. We generally discourage chain hotels but provide accommodations with unique features or an authentic feel. After your flight arrives in Dubrovnik, we will have someone meet you at the airport and bring you to your centrally located Dubrovnik accommodation. Today you’ll be exploring the elegant main streets and picturesque paths of Dubrovnik, with your own personal guide. This truly is one of the most beautiful medieval cities on the Adriatic. A walking tour of Old Town will take you to its elegant main street and most of its most important sights: The Franciscan Monastery, Onofrio’s Fountains, Sponza Palace, Orlando’s Column, the City Bell Tower, the Church of St. Blaise, the city’s patron saint, and Rector’s Palace, the seat of the Republic and the Cathedral. This is the perfect orientational tour of the Old town and will give you the best insight into the rich history of Dubrovnik. You’ll learn what there is to see and do in Dubrovnik and how to get around. Let’s get the adrenaline pumping today, shall we? A sea kayaking excursion or a buggy adventure are two great activities we highly recommend. The Buggy Safari is an hour-long excursion that lets you drive off-road to see wildlife, fortresses, former minefields and war sites. It all culminates in a dramatic 360° view of the entire region from Srd mountain. If you’d rather explore sea than land, a 3-hour sea kayaking excursion is your best choice. You’ll paddle along the walls of Dubrovnik, getting a new view of the city, then go for a swim in one of the secluded coves, where you’ll really become one with nature. Today you're off to Hvar, Europe's sunniest island! Our representative in Dubrovnik will provide you with tickets for the ferry which leaves in the afternoon. You will be picked up from your accommodation by your private driver who will take you to the port in plenty of time for your departure. Alternatively, if you are looking for an opportunity to sight-see along the way, we recommend our private transfer option. For an additional fee, we can arrange for a private driver to pick you up in Dubrovnik and bring you straight to Split. If you choose, you can stop along the way, perhaps to explore Ston, the oyster capital of Croatia, or Mostar in Bosnia to see the famously reconstructed bridge. 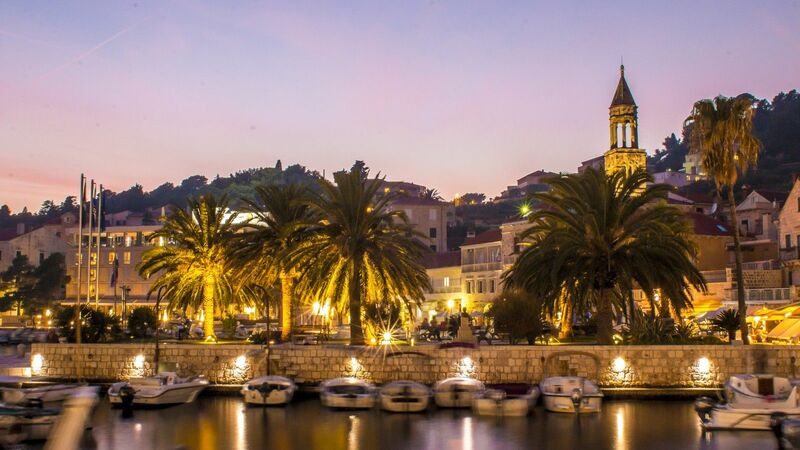 When you arrive in the port of Hvar, you will be met and brought to your accommodation. Today you’ll be exploring the island with a local guide. Hvar is a gorgeous combination of beaches and olive groves, fisherman and grape growers. You’ll be treated to an off-road tour through typical old villages, combining amazing scenery with authentic local charm. The unspoiled nature, panoramic views, and luscious groves are a sight to behold. You’ll stop at villages including Pitve, which dates back 2,000 years, for a delicious lunch of locally sourced cuisine, and maybe even a glass of the famous local rosé wine. After a full day of sightseeing and adventure, you’ll be driven back to your accommodation. Vis is one of the most remote islands on the Adriatic, and makes for an unforgettable excursion. After a pleasant sail you will arrive at the Blue Cave, a natural phenomenon which can only be entered by small boats. The light here is marvelous, as the sun reflects inside the cave through the water. Next you'll continue to Komiza, you'll have some free time to stroll around, have lunch or go for a swim. On the way back to Hvar your skipper will make another stop at the Pakleni archipelago, where you'll have time for a swim and drinks at one of the few restaurants found on these sparsely populated islands. A taxi will bring your from your Hvar accommodation to the port where you'll enjoy a quick 1-hour ferry ride to Split. You'll arrive to the Split ferry port, and from there it is an easy walk to your accommodation in the city's Old Town. We will arrange for assistance with your luggage. Today you’ll exploring the inspiring city of Split with a local guide. You’ll be picked up at your accommodation and led through the UNESCO-listed 1,700-year-old Diocletian’s palace, which is just the beginning of the tour. You’ll also see the Cathedral of Saint Duje, one of the most beautiful cultural wonders on the Adriatic coast. And you’ll explore the ancient cellars as well as the square in the center of the palace. The stunning Roman temples will awaken the spirit of another time for you, as will the famous Golden Gate and the big statue of Grgur Ninski. This is the best way to get to know the incredible history of this beloved destination. If you’re looking for a delicious lunch or dinner in Split, we highly recommend Konoba Fife, right on the harbor. Here you’ll find delicious local seafood and an authentic atmosphere at the right price. It’s a charming spot that’s inviting and unpretentious, authentic and definitely not stuffy. You’ll enjoy the atmosphere almost as much as the food. Be sure to ask about the daily specials. A rental car will be delivered for your use for the remainder of your trip in Croatia. It will be a manual transmission, so let us know if you'd prefer an automatic. We can also arrange for a GPS to be provided at an additional fee. After you have your car, you are off to discover Plitvice National Park. If you're planning to explore the park the following morning and want to fill the day there are plenty of potential stops, only a little off the route. Nature lovers will want to stop at the Krka National Park to see the stunning lakes and waterfalls, followed by lunch at Skradin on a picturesque inland bay. If you like wine, we can arrange for a special tasting at the renowned Bibich winery in the hills above Skradin, which is suddenly famous since Anthony Bourdain paid the place a visit. In Sibenik, you can visit the interesting UNESCO-listed Cathedral of St. James and then enjoy lunch at the excellent Pelegrini wine tavern next door. The Roman Emperor Diocletian made Split his home in the 4th Century AD and built a vast palace complex on the waterfront that stands to this day. In fact several of the accommodation options we offer in Split are nestled inside the walls. These days there is an embankment in front of the palace but the water used to go right up to the wall. It's on this man-made strip of land that you'll find the Riva, a pedestrian promenade bustling with life. Split's UNESCO listed Old Town is contained within these old walls and it's a pedestrian-only maze that it is quite easy, but fun, to get lost in. Who know what romantic hidden cafés you might find in one of the narrow streets and alleyways. To get the best out of your time in Split however, we recommend taking a tour with a local guide. Split is very well connected for flights, with an international airport a half hour drive away and is a popular stopping point for our guests on their way between Dubrovnik and the islands of Hvar, Vis or Korcula, all easily reached by a ferry from Split port. If you base yourself in Split for a few daysyou will find it is also well located for visits to some of Croatia's stunning national parks. We'll advise you on the best way to reach your accommodation in Plitvice. Depending on whether you've seen enough of Pltivice, you can either depart for Rovinj in the morning or spend some time exploring the park and head out mid-afternoon. Along the way, be sure to stop in the picturesque seaside resort of Opatija, once the retreat of Habsburg-era nobility. You'll want to stroll along the famous boardwalk and perhaps enjoy a nice lunch followed by a drive along the breathtaking Kvarner Bay. After your sightseeing stops, you'll probably arrive in Rovinj in the late afternoon, a good time to check in to your accommodation. Relax after your drive with an evening stroll around Old Town and the lively harbor area. If you have traveled to Rovinj in a rental car, a self-driving tour of the surrounding region of Istria is an excellent way to spend a day. This is a place of romance and myth that is often compared with Tuscany. From the hills to the coasts you can see the best of the region on a pleasant drive, and also taste some of the local cuisine. The stops we recommend most are Pula, with its ancient Roman amphitheater, and the hill towns of Motovun and Groznjan. All three spots have a charm of their own and really show off the best of the region's architecture, landscape and cuisine. Today’s a good day for a bike ride, don’t you think? We suggest exploring “Zlatni Rt,” also known as the Golden Cape Forest Park, which is closed off to motor vehicles. About 1.5 kilometers from the center of Rovinj, the park is easy to get to, and you can rent your bikes in town and ride there. You’ll be in for a scenic ride through gorgeous scenery. The main road goes directly through the park, and there’s also a beach to visit, on the other side of the thick woods. Keep your eye out to appreciate the local flora and fauna. In the summer there are numerous restaurants in the park where you can stop for a drink or something to eat. A driver will pick you up from your accommodation and take you to the port in time to catch the 3.5-hour ferry to Venice we will have booked for you. You'll arrive in Venice at the city's ferry port. Since Venice is a very unique city, transport options vary greatly based on the location of your hotel. Because the transport could vary, we won't include it in this package. Later today you'll be taking your taste buds on a delicious adventure with a small group tour of Venice's Bacari wine bars and their famous cicchetti dishes. These small tapas-style dishes are ideal for teaming with Italian wine, so tour the city's famous bars and try everything from fried olives to wedges of cheesy polenta. Venice is a city of dreams and romance. A vacation here with your sweetheart will be a memory you’ll cherish forever. It’s hard to go wrong when you’re strolling along the canals in one of the most beautiful and unique cities in the world. You can enjoy a variety of excellent tours on land and water that will help you explore all of Venice’s secrets. There are plenty of wonderful restaurants and bars to visit, and the lights and live music on St. Mark’s square at night are just lovely. The atmosphere throughout the city is incomparable. Every little alley leads to some new discovery, and the ever-present sound of the sea is enchanting. But of course, no romantic visit to Venice is complete without a gondola ride. As you get close in your own private gondola, floating along on the gentle current as waves lap up against stairs leading to ancient palaces, you’ll know why Venice has always been a city for lovers. "Trip was tailor made to suit our budget. Fast and efficient service regardless if it was by phone call or email. Thank you JayWay Travel for a seamless hassle free opportunity to meet and enjoy the people, history, beaches, food, wine and all the beauty of Croatia! JayWay, You Rock!" "JayWay is the only way to travel to Central and Eastern Europe. Especially if trying to cover multiple cities and/or countries in one trip. All of our arrangements made by JayWay were seamless and we'll use them again when there is a next trip to plan." "They were excellent! Every penny was worth it! Amazing experience - Best trip ever so far." We have never used an agency before, and I was skeptical about how much value they might add – but it became clear right away during the planning process that we might the right decision to work with JayWay Travel. JayWay's deliberate planning process, good counsel and high level of flexibility made our first foray to Eastern Europe our best family vacation to-date. From start to finish, expectations were exceeded at every turn, and both the quality of communication and highly efficient use of technology is first-class. "Very useful website and excellent staff made for a seamless and excellent trip! Planning was easy using your website and support from your staff was excellent!" "The service from start to finish was impeccable. We were able to enjoy a stress and worry-free trip with the help of JayWay Travel and their expert planning. Pavla was a great point of contact. Very helpful and responsive, as well as extremely pleasant. The accommodations were top notch. The rooms were as described in our itinerary. The transfers were great. Everyone was punctual. The service was wonderful - everyone was super helpful and informative." "For Croatia travel, I highly recommend JayWay Travel now that I've used them TWICE and had flawless travel plans with an interesting itinerary prepared by Jayway. Josipa who met us at our first hotel and gave us a short "briefing" AND a Jayway cell phone to use with everyone's numbers pre-programmed in the phone, was genius." "JayWay listens, gives you good feedback and options, then executes on your decisions. They were great with customer service during our trip and took care of anything that came up to our complete satisfaction. All 3 guides were excellent. The cooking class was our absolute favorite - Juliana and Marto were the best hosts and we had a great time eating good food, drinking good wine and enjoying their company." "You may not have heard of JayWay before, and they tend to be pretty low-key about their skills and abilities, but they do a first-rate job. We got exactly what we asked for, without any hype or unnecessary frills. And the price was very fair. We can't say enough nice things about the guides and drivers and staff in Croatia. Jo and Antonia are wonderful, and we must give special praise to Miriam, our guide in Istria. Her knowledge and enthusiasm for Pula (who knew it could be so interesting?) Motovun, and the rest of the region was just terrific. We ate all those truffles just for her!" "The guides were all excellent. The SUV trip on Hvar with Ivan was exceptional. We very much enjoyed travelling and conversing also with Matthew. During the transfer from Dubrovnik to Korcula, we had some extra time, so he took us for a wine tasting at a winery, which proved to be a memorable experience. The accommodations, transfers and tours arranged by JayWay all contributed to making this a most enjoyable and relaxing trip." "JayWay provided the organization and took away logistical concerns and allowed me to have a stress-free trip, without the rigidity of a completely pre-planned one-size-fits all tour." "The trip planning went very smoothly. None of the travelers were familiar with Croatia and we appreciated Carmine's input on the itinerary, hotels and potential tours. We did not choose to arrange many tours in advance, however the wine tasting arranged by JayWay was superb and we enjoyed the walking tours of Split and Dubrovnik. The JayWay staff that met us in Split and Dubrovnik were friendly and extremely helpful in orienting us and providing helpful recommendations. Ana was our contact in Europe prior to the trip. She answered all our questions in a courteous and timely manner and provided excellent restaurant recommendations for each of our destinations." "JayWay is the most professional travel company we have ever dealt with. They provided a unique travel experience we could not have achieved on our own. Their in depth knowledge and connections locally gave us access to places and activities we will remember forever."